Remove from oven when thermometer reads 3-10 degrees below desired doneness. For cooking steaks marinate for 6-8 hours or needle to tenderize. Alternative : thinly slice partially frozen steaks across the grain and marinate 6-8 hours for use in stir fry / Satay. Add liquid to cover and cook at 120°C (250°F) to 160°C (325°F) until fork goes into meat easily. 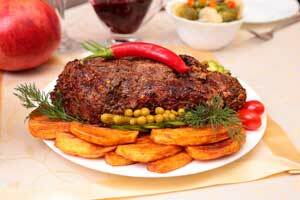 Match the correct method of cooking to inherent tenderness, and you will have a tender wild boar every time. 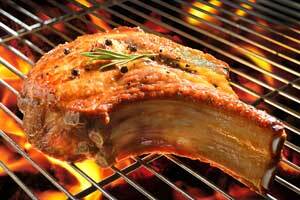 Wild boar meat is lower in hat and higher in moisture than its cousin pork. This means wild boar will cook more quickly than pork. Since wild boar muscle has more marbling, do not cook steaks and roasts past medium done stage.